Provides intense nourishment and hydration. 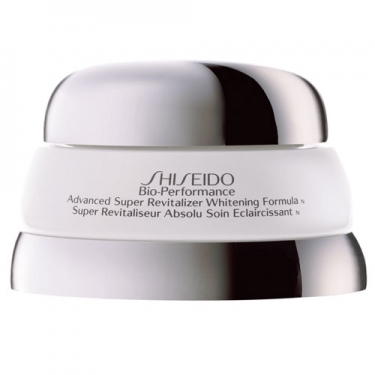 Advanced Super Revitalizing Cream is a skin care cream formulated with the cutting edge technology to fight premature aging. This 2012 latest formula with exceeding results is highly-concentrated. Just like the facets of a beautifully cut diamond determine its brilliance, the tiny triangular facets of the skin's surface determine its youthful vividness. 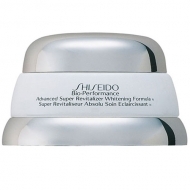 Shiseido's laboratories discovered the revolutionary solution against premature aging - giving back your plumped and resilient youthful look. The exclusive new Bio-Revitalizing Complex* reinforces elastic fibers**, giving them the strength to put compromised skin facets back into ideal shape. Your skin is immediately smoother and more supple***. Within just one week, skin looks more youthful. After 4 weeks, 93% of women reported skin became fully smooth. Overall look is dramatically improved. This cream can be used in the morning or at night. Apply to perfectly cleansed skin. Smooth the product onto entire face from the center of the face outwards, to counteract loss of firmness. Apply to neck, massaging in the same direction. Note that this product can be used as makeup primer.